"Rather than one huge building, Pine Knot consisted of many smaller buildings, each built to take advantage of the beautiful and isolated setting." The A&E channel has always been the home for wonderful tours through historical locations and monuments. America's Castles is one of the best vessels to present these tours, as narrator Joe Van Riper takes us through the most lavish and expensive homes in the United States. These estates aren't always "castles" in the Arthurian sense, but they enormous and usually decked out in sheer elegance. America's Castles: The Grand Tour features six shows from the series, all of which focus on a particular "neighborhood" with multiple examples of these "castles" in each. Disc 1 begins with Grand Plantations, a journey to the old south, with the most interesting footage coming from a mansion that was never finished due to the Civil War. The interesting part of this is that the family still lived in the one part of the house that had been completed. The other episodes on Disc 1 are also quite fascinating, with Florida's Grand Estates being the better of the two. This segment talks about the Mar-a-Lago, which Donald Trump now owns, but was (figuratively, not literally) built by cereal, more specifically, the Post family. Gold Coast Estates talks about various sites, such as the Vanderbilt's Eagle's Nest, which is right on Long Island in New York. Disc 2 has three more episodes, including a look at the Hudson River Valley Estates of the Rockefeller's country estate Kykuit, Frederick Vanderbilt's Hyde Park mansion, and a few others. The best show here is the overwhelmingly gorgeous Newport Mansions in Newport, Rhode Island. All of these are mostly summer homes for the rich, with the Breakers and Chateau Sur Mer being the most impressive. The third episode is a bit different, focusing on the mountainous Adirondack Camps. These aren't the palatial estates that we've seen so far, as these mostly secluded places are for those who enjoy the wilderness, with all of the essential amenities, of course. If there's one "can't miss" episode in this set, it has to be Grand Plantations. The Civil War has fascinated so many historians that it already has a set audience, but those of you who only have a fleeting interest in what is arguably our nation's most important historical period, would see such interest spike greatly after exploring these landmarks as they look today. The condition they are in is remarkable, and imagining the historical figures of the time living in these buildings is another part of this show's draw. It's great to actually get to go inside these intimidating structures, as America's Castles successfully toes the fine line between informative, historical television, and travel advertisement. Sure, the tours are as comprehensive as can be, but they aren't going to make you cancel any travel plans with the feeling that you've already seen all that you need to see. Just about every inch of these buildings are explored, with time constraints being the biggest factor in the editors' decisions as to what to focus on more. For the most part, they do an excellent job in choosing the right landmarks. Joe Van Riper's narration is the sets other big draw. His distinct, never overbearing voice seamlessly flows with the camera as it pans throughout the different rooms. There's never an awkward inconsistency between where the camera has taken us to at a given moment, and what Van Riper is describing. Even if a room seems a bit more bland and uninteresting compared to the rest of the "castle," Van Riper's delivery keeps us focused on the subject at hand, and, more importantly, keeps us interested in what will come next. Getting such an intimate look at these lush buildings is a rare treat, but good luck keeping your feelings of jealousy in check after these tours. These aren't exactly places you can look to buy with a simple call to your local realtor, but what better way to go mansion-hunting than in the comforts of your own home. Image Transfer Review: These full-frame transfers come from seemingly flawless source material, but there are quite a few soft, blurry images that pop up occasionally. The colors are well-rendered, with excellent shadow and contrast levels, and solid black levels. Overall, expect to see these shows look the same way they did on television. Audio Transfer Review: The Dolby Digital 2.0 mixes are good, but not flashy by any means. Everything pretty much stays up front, with the rear speakers only kicking in a few times for some of the music cues. Clearly hearing the narration is never a problem, and there's even some bass entering into the mix. Extras Review: There aren't any extras at all. History buffs and A&E fans in general will love every minute of America's Castles: The Grand Tour. 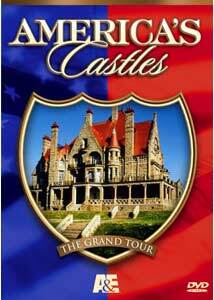 This wonderful collection of episodes from the American Castles show will leave fans begging for future DVD sets from A&E Home Video. TV-broadcast-quality audio and video are adequate technical aspects of these discs, but, unfortunately, there aren't any bonus features at all.